BusyKislig Shires Byerly She (Susan) was an inspiration to me and I admired her efforts to help protect horse farms in Marion County. The lawsuit that she filed, serving as her own attorney, against the County for changing the zoning was a so inspiring! 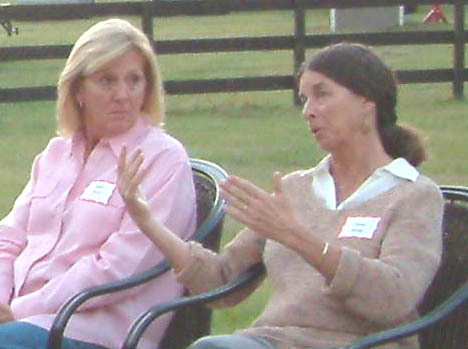 From the article: “Enter horse farmer Susan Woods. The environmentally active Woods challenged the decision, arguing that the project was not compatible with the rural, horse-farm character of the area. She argued that so many houses would harm the aquifer because of the karst topography, and that the county had failed to meet the long accepted “demonstration of need” benchmark. With no lawyer in tow, she took her case to DCA. She won a rare, almost unheard of reversal of DCA’s decision … and the DCA’s support through the remainder of the process. The article below is a succinct discussion of the item that just went before the Florida Cabinet as FLWAC. The hour-long hearing included presentations by Pelham, Marion County Commissioner Barbara Fitos and Linda Shelley on behalf of the comp plan applicant. Governor Crist made a motion that was seconded and unanimously approved that approved DCA’s draft Final Order based on the administrative law judge’s findings of fact and conclusions of law. In a nutshell, the applicant did not overcome the demonstration of need for the land use change and Marion County is to rescind the adopted comp plan amendment. In discussions by the Cabinet while entertaining the motion, it was voiced that the Cabinet does not want to set precedent that a land use change can be adopted and found in compliance when it has not demonstrated need. Published: Tuesday, September 15, 2009 at 6:01 a.m.
A lone citizen’s challenge to a 2007 land use change approved in neighboring Marion County will be taken up today by Gov. Charlie Crist and the Florida Cabinet. It is a growth-management case of statewide significance. The Cabinet will hear the case of Susan Woods v. Marion County. The David vs. Goliath case has a single citizen taking on big development and revolves around the County Commission’s vote to change 396 acres of farmland from rural to medium-density residential. Castro Realty Corp. sought the land-use change so it could build 790 houses on rolling pastures. In reaching its 3-2 decision, the commission ignored the recommendation of its own planning staff, which concluded the houses were not needed in an already glutted housing market. The commission’s action was sent to the Department of Community Affairs for final approval, which it got. Enter horse farmer Susan Woods. The environmentally active Woods challenged the decision, arguing that the project was not compatible with the rural, horse-farm character of the area. She argued that so many houses would harm the aquifer because of the karst topography, and that the county had failed to meet the longaccepted “demonstration of need” benchmark. With no lawyer in tow, she took her case to DCA. She won a rare, almost unheardof reversal of DCA’s decision … and the DCA’s support through the remainder of the process. Comprehensive land-use plans are drawn up to ensure balance in how we develop our community. Changing those land uses, even a little, means changing the character of the community — forever. With the Cabinet’s ruling at hand, the development industry and conservation and environmental forces have lined up behind the opposing sides. Determination of need is the bedrock upon which a generation of Florida growth-management policy is built. If the Cabinet abandons what is left of Florida’s growth-management guidelines by rejecting Woods’ determination-of-need argument, it will set a dangerous precedent for the entire state. It will render comprehensive plans all but useless and undoubtedly foster more sprawl. The Cabinet should side with Woods, the DCA and Johnston. And as for Woods, our thanks for reminding us that one person still can make a difference in making sure government serves the people justly, even against tall odds.